SINGAPORE - More than two years after a Jurong West market burned down, its replacement was given its official opening on Tuesday (Jan 1). The new $6.2 million two-storey market, eating house and community complex - known as Jurong Central Plaza - is located at Jurong West Street 41, the same site as its predecessor. The second storey houses an active ageing hub that consists of a senior activity centre, eldercare centre and an open space for activities. In 2016, Lim Ying Siang, then 41, was charged for setting fire to Styrofoam boxes at the market at Block 493, with the knowledge it would likely destroy it. The fire in the early hours of Oct 11, 2016, razed a wet market and coffeeshop to the ground, affecting the livelihood of stallholders and forcing residents to shop elsewhere. A temporary market was constructed opposite Block 495. "This project started off when we had a big problem," noted Deputy Prime Minister Tharman Shanmugaratnam, who was guest of honour at the launch of the new complex. "But this project shows that no problem is too big when we work together with one heart." Residents said they liked the ventilation and wide corridors at the new complex. "It is very convenient here because everything is under one roof but some of food prices in the coffeeshop have gone up," said former taxi driver B. Tan, 76. Some market stallholders also said their rents seemed to have gone up. Madam Jeo Li Yan, 56, who sells meat, said her rent has risen from $800 to $1,200 a month. Jurong GRC MP Ang Wei Neng clarified that rents per sqm have remained the same but some stall owners may be paying more because they have been allocated a larger space. The proximity of the market to the active ageing hub, which will start operating in the second quarter of this year, not only makes various services more accessible to the elderly, it also allows for collaborations. 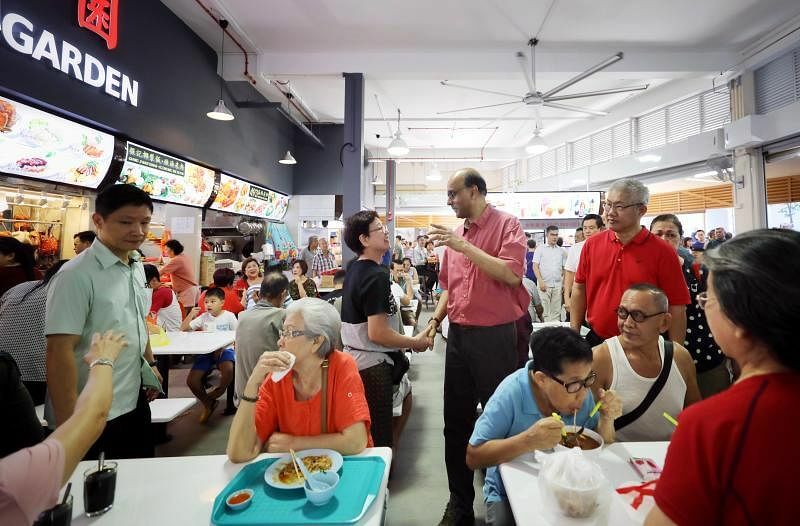 For instance, there is an arrangement now for market stallholders to donate meat and vegetables so that volunteers can cook and serve free lunches upstairs for needy senior citizens every Thursday. Mr Ang said: "Each stallholder will donate about $5 to $10 worth of what they are selling so that it is not a lot for each stallholder but it all adds up and it enables it to be sustainable and meaningful for residents."